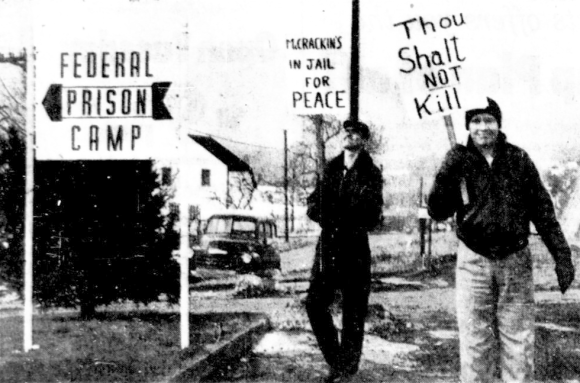 Richard Fichter, left, Springville, and Dale Rogers, right, a native of Texas, are shown as they picketed the Federal Prison Camp at Allenwood, Union County, in protest over the imprisonment there of the Rev. Maurice McCrackin of Cincinnati, Ohio. The minister, who has refused to pay income taxes because the money is used for defense expenditures, was imprisoned for failing to obey a summons by the Internal Revenue Service to appear in court. Williamsport, Dec. 29 (AP) — Sympathizers who promised to “do the same thing all over again” picketed the federal prison farm near here this weekend in support of the Rev. Maurice McCrackin of Cincinnati. The Rev. Mr. McCrackin, a pacifist, is serving a six-month sentence for refusing to cooperate with the Internal Revenue Service. He was brought to the prison farm last week. The Cincinnati pacifist was sentenced in federal district court at Cincinnati Dec. 12 after refusing to pay income tax on the grounds that the money goes toward supporting military establishments. The sympathizers who picketed the prison farm Saturday were Dale Rogers, a native of Texas who is a student at Lincoln University, near Oxford, Pa., and Richard Fichter, a former Methodist minister who now runs a dairy farm at Springville, Pa.
Federal prison officials would make no comment on the incident. I haven’t found much else about Richard Fichter. There’s an interesting 1957 story in which he jumped on stage during a live broadcast of the game show The $64,000 Challenge and tried to read a statement beginning “America, I have a challenge. The Russians are ahead of you…” They bundled him off to a psych ward, and I haven’t been able to determine any more about the contents of his challenge. In 1957 , Fichter had picketed the White House in behalf of an imprisoned draft resister. Dale Rogers is even more of a blank to me. Ashland, Ky., Dec. 29 . — (AP) — Members of a peace group of six charged today they were ordered off a highway by state police while demonstrating to welcome Katsuki James Otsuka from prison. Otsuka, a 28-year-old American-born Japanese [sic], completed 120 days in the Ashland Federal Correctional Institution, near here, for non-payment of war taxes. Warden R.O. Culver indicated, however, that any release was out of his hands. He said Otsuka first must appear before United States Commissioner J.C. Yeager here for non-payment of a $100 fine in connection with his sentence. The peace group, led by the Rev. Ralph Templin of the Wilberforce, O., University faculty, appeared on the state highway near the prison at 6 a.m. .
At Frankfort, Police Commissioner Guthrie F. Crowe said three troopers have been assigned to maintain order outside the institution. The troopers were sent there at the request of Warden Culver, Crowe said. The state policemen have been instructed to keep the highway clear and to see that no one is injured, Crowe said. “The police will not interfere with placards, banners or speeches,” he added. Crowe said the group interfered with the free movement of guards and other institutional employes as they went to work this morning. Templin and the Rev. Ernest Bromley of Wilmington, O., later attempted to interview prison officials about Otsuka’s release, but were told by a tower guard that none was available at that hour. Templin said that “four carloads of state police” drove up shortly after 8 a.m. and ordered him and the others, all carrying peace placards, off the road and that they broke one of the placards. Templin said he asked what law was being violated by the picketing, but that he got no answer. No one was available at the Ashland state police detachment for comment. Other demonstrators included Henry Dyer of Yellow Springs, O., employe of a printing establishment; Lloyd Danzeisen, a railroad postal clerk of Brookville, O., near Dayton, and Mr. and Mrs. Wallace Nelson of Covington, Ky.
Nelson is a construction worker. Otsuka, native of San Diego, Calif., was sentenced to 90 days and fined $100 on Sept. 1 in Indianapolis, Ind., by Federal Judge Robert C. Baltzell for refusing to pay 29 per cent of his income taxes, amounting to $4.50, which he considered to be for war purposes. He has served an additional 30 days in lieu of the fine, but Culver said he must still appear before the commissioner. Ralph Templin was a former missionary stationed in India, and an admirer of Gandhi’s techniques. The British government expelled him because of his support for Gandhi’s movement. Back in the U.S., Templin noted that Gandhi had eagerly learned from American predecessors like William Lloyd Garrison and Henry David Thoreau, and proposed that Americans should return the favor by learning a thing or two from Gandhi. To this end, he helped to form the “Harlem Ashram” and its Non-violence Direct Action Committee, which concentrated on non-violent actions to fight racial discrimination. Dyer was one of the World War Ⅱ conscientious objectors who was further radicalized by / helped radicalize the civilian work camps to which drafted conscientious objectors in the United States were assigned (he was later one of thousands of conscientious objectors the U.S. imprisoned). Lloyd Danzeisen was one of the “Peacemakers” group. Wally & Juanita Nelson and Ernest Bromley I’ve covered here before in more or less detail.